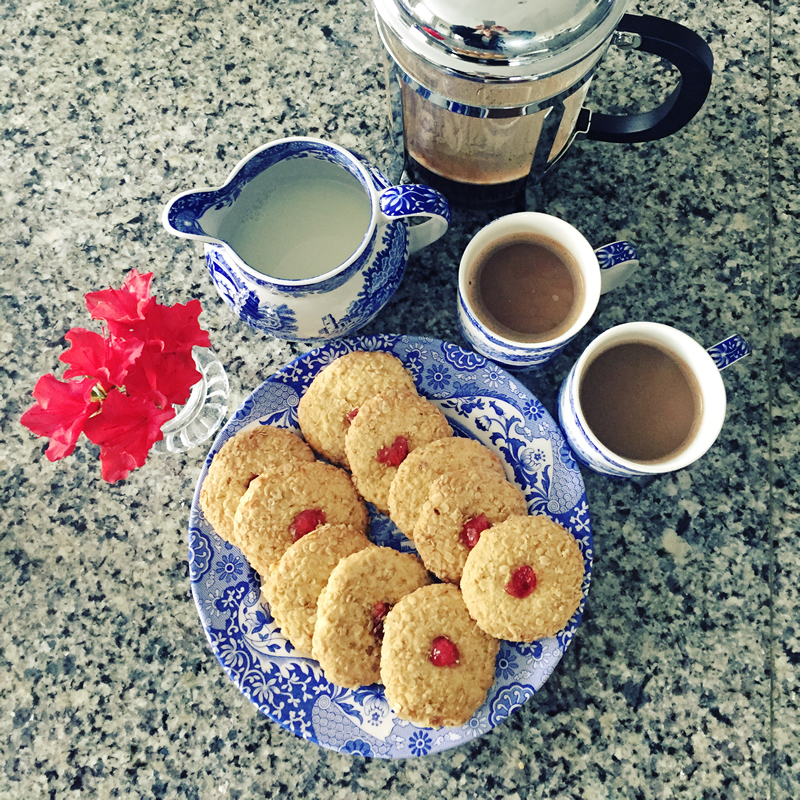 We love a home made biscuit, whether with morning coffee or afternoon tea. Made with rich Cornish butter and free range egg, they are definitely worth the extra effort and we like to think the rolled oats in this recipe add a healthy element. These simple but delicious ones are also perfect with an early morning cuppa in bed or late night hot chocolate. Highly recommended to leave in Kilner jars in guests’ bedrooms in case they get the munchies. A bit of old fashioned hospitality which is still appreciated today. This is also such a flexible biscuit when it comes to decoration. Some ideas for changes are substituting an almond, sugared violet or chocolate button for the cherry, but you can always try your own ideas to go with a themed coffee morning or tea party. 1. Pre heat oven. Grease 2 baking trays. 2.Cream butter, lard and sugar, slowly beat in egg and vanilla essence. 3. Stir in flour, then roll into 18-20 walnut size balls in your hands. 4. Spread the oats onto greaseproof paper and toss the balls in them until evenly coated. 5. Place the balls, slightly apart, on baking trays, place a piece of cherry on each. Bake for 15-20 mins until lightly browned. When cooked cool on trays for a few minutes then transfer to wire rack. 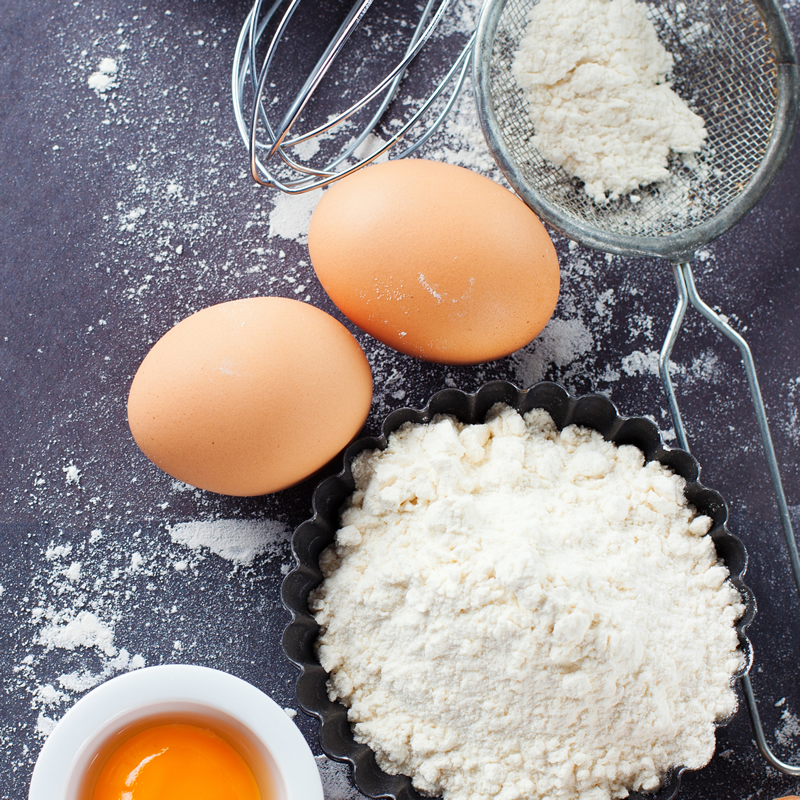 Be very careful not to leave the kitchen until they are safely stored in an airtight container – otherwise you might find they have mysteriously disappeared. 1) Think of the mood of the room you want the arrangement to go in, there may be particular colours or art that you want to reflect. 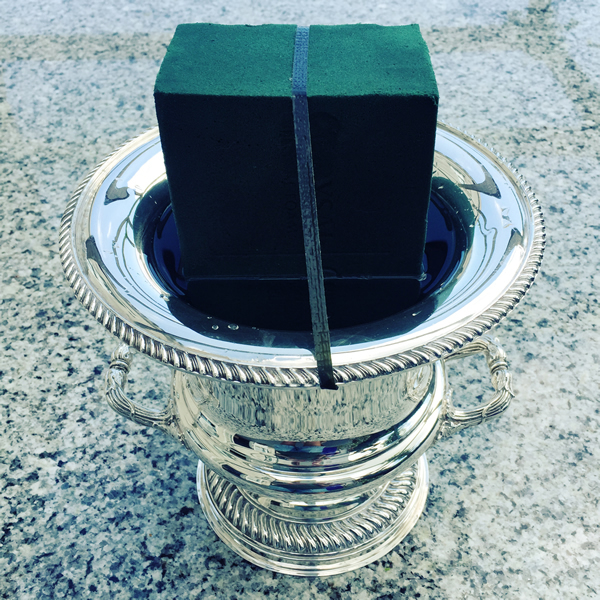 2) Select the container to be used before the flowers and foliage. Some of the contents will need to be two thirds as high as the container, or double the height if it is shallow. 3) Pick your foliage and flowers at least two hours before creating the arrangement and preferably the day before, so everything can have a long drink in a bucket of water. 4) Make sure you pick plenty of foliage and flowers, as you do not want to be going back to find more. 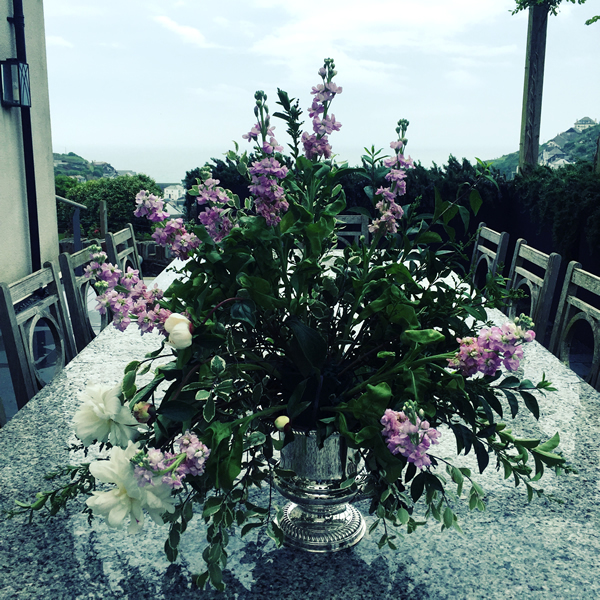 Foliage and flowers with woody stems should be placed on a wooden board and smashed at the bottom with a hammer before putting in water to enable them to drink more. 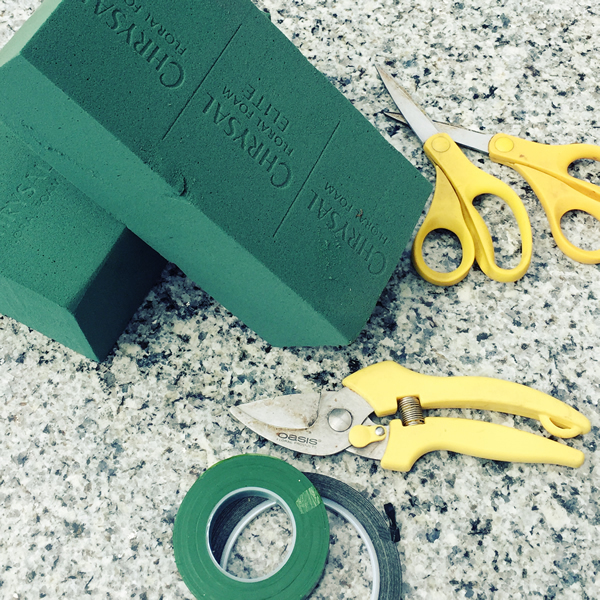 5) Before starting the arrangement, make sure you have all your equipment ready. We had oasis, florists’ sticky tape, scissors and secateurs. 6) The oasis holds the stems in place and also provides extra water. After cutting it to size, soak in the sink and then put in the container, holding it in place with sticky florist tape. 7) A drop of bleach or flower food should also be put in the water to keep the arrangement fresh for longer. 8) Start by putting in the foliage at the back of the arrangement. 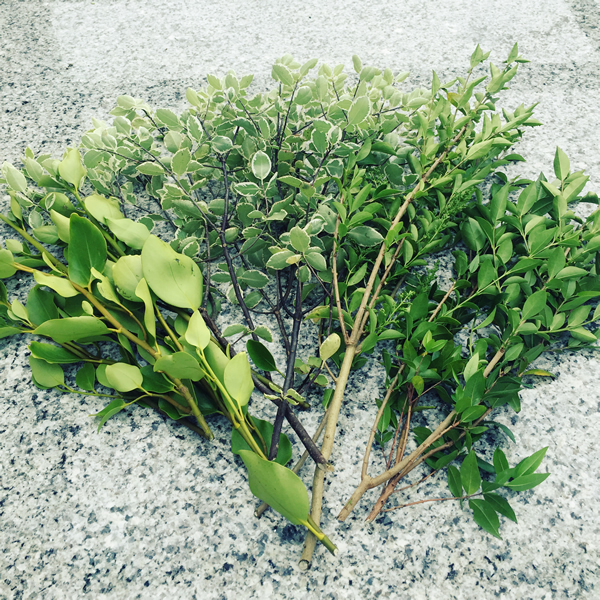 We used privet, griselina and pittosporum from around the garden. 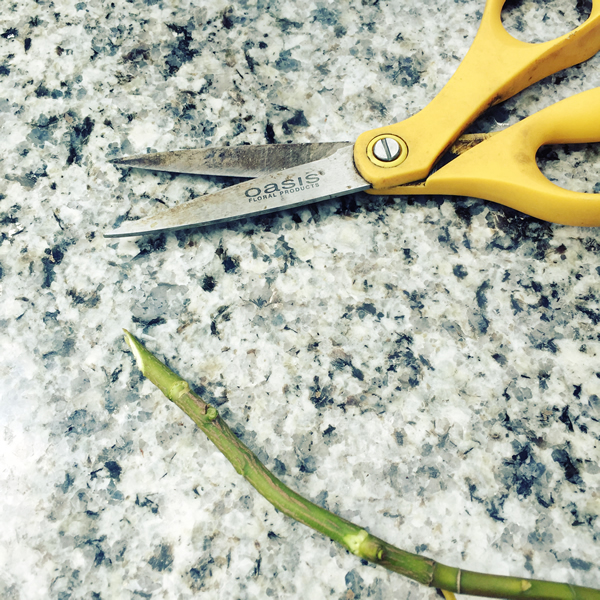 9) Before placing each individual stem in, it should be neatly cut on a downward diagonal to making it easier to absorb water. 10) Damaged leaves should be removed and any stray leaves and stems which are along the central stem which is going into the oasis. 11) After putting in foliage at the back and around the sides, stand back and assess how they the arrangement is coming together. 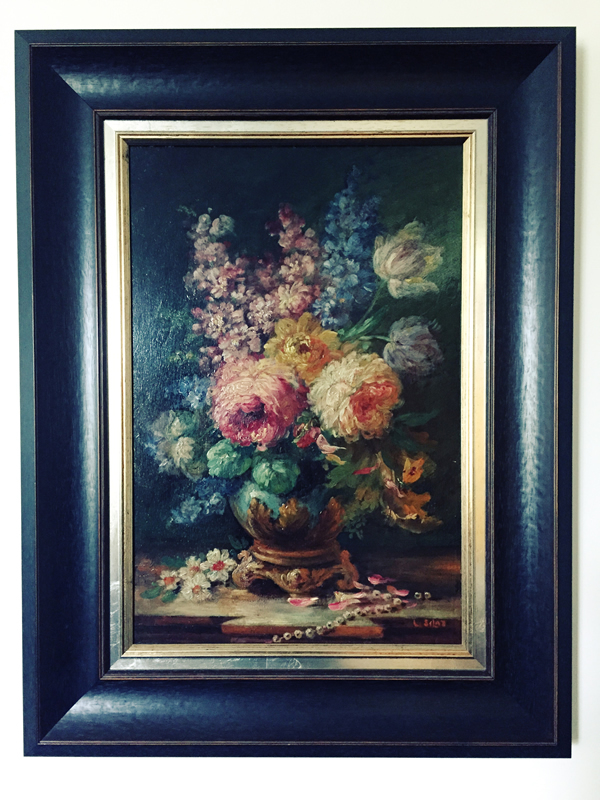 Think about, colour, texture, harmony and space – both in the arrangement and around it. 12) When you are happy with the basic shape, prepare your main flowers as before. 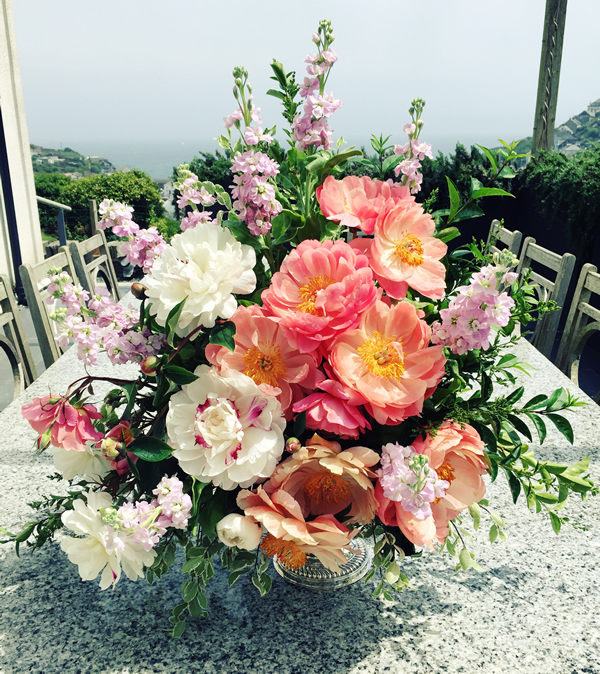 Jan provided tall, sweet smelling stocks, and Peter also used Coral Charm peonies and Ali Baba roses from around the front lawn and Maxima Festiva peonies from the cutting garden. The roses also had their prickles cut off and the peony leaves which were removed were saved for filling in the arrangement – nothing is wasted. Two extra tips with peonies are to give them a shake to get rid of any ants attracted by the sticky sepals that cover the peony bud and to knock any closed bud against a hard surface to encourage it to open. 14) When you have finished, take a moment to admire your work. Peter was thrilled with his arrangement and is looking forward to creating more for our guests. 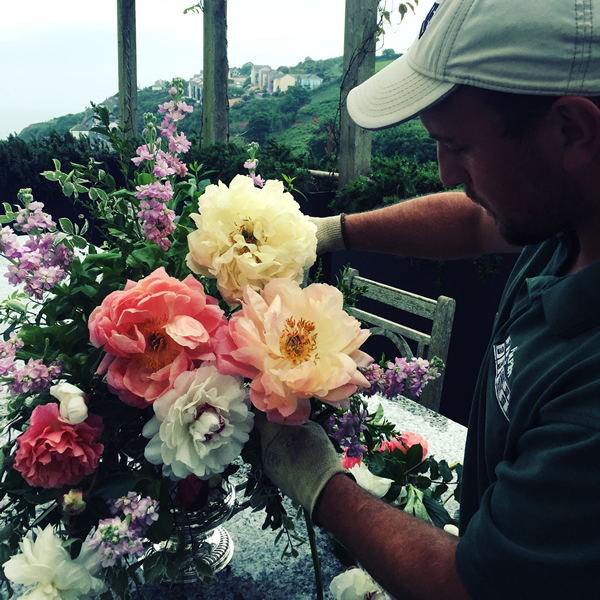 Jan is happy to give private lessons for guests staying at Polpier and Penpol, whether on general flower arranging or wedding and party flowers. 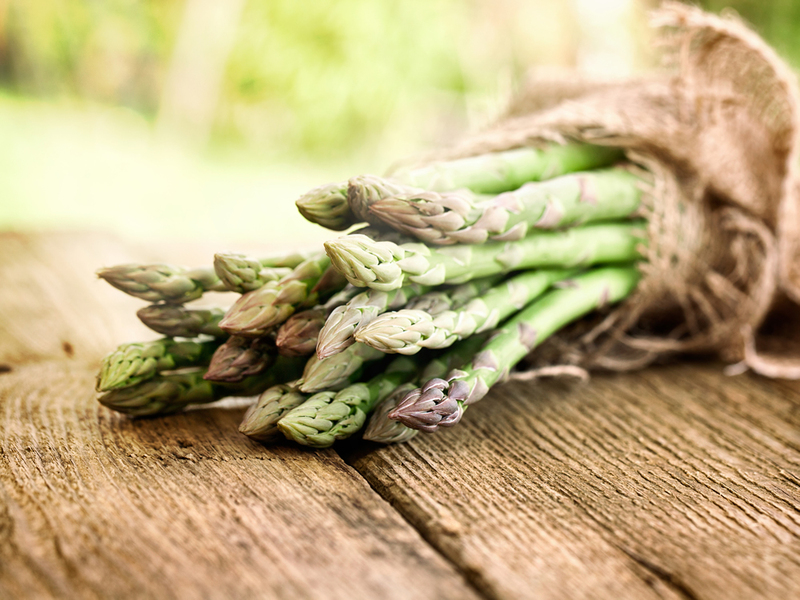 Polpier’s asparagus bed provides a generous harvest of this luxurious crop from mid April to mid June. 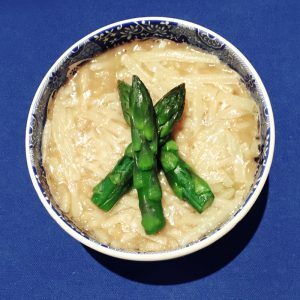 Delicious eaten with melted Cornish butter and sea salt, it is also gorgeous in a risotto and our recipe guarantees every bit of the asparagus is used. Perfect as a main course for four people, it is also great to serve as a starter for larger groups, particularly in small bowls, because it can be easily eaten with just a fork even when standing up. 1. Prepare the asparagus. Bend each piece so the woody end snaps off and use these with one of the chopped onions to make the vegetable stock. The stem should be cut into bite size lengths to add to the cooking risotto and the heads separately steamed and refreshed in ice cold water so they keep their colour and shape to add as decoration to the finished dish. 2. For the risotto, heat the olive oil in a pan and sweat the onion and asparagus stems, making sure they do not brown. Add the rice and stir frequently to coat with oil for one minute, followed by the hot vegetable stock one ladleful at a time. Keep stirring for approximately 15 minutes at a gentle simmer until the liquid is absorbed, adding extra stock until the rice is tender and creamy. 3. Add the lemon juice, a good grating of pepper and a pinch of salt to taste but bear in mind the Parmesan is salty. Put the risotto into a warmed serving dish and sprinkle with the grated Parmesan. It can be kept warm for up to 15 minutes before serving, but only decorate with the asparagus spears at that point so they are beautifully bright green. Hope you enjoy this yummy vegetarian dish. I am thrilled to start our blog by sharing some of our fantastic guests’ reviews. 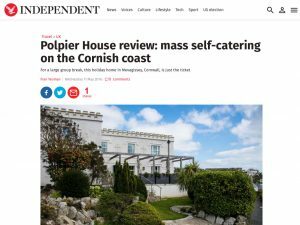 From family parties (www.independent.co.uk) to silver panthers (www.high50.com) and stylish trend setters (suitcasemag.com), they all found something to love about us and Cornwall. Based in the Cornish Riviera surrounded by miles of stunning beaches, I am looking forward to letting you know our news and highlighting the events and activities which make holidays here such fun – fun that includes dog guests. In addition, as it is a famous foodie county, I will be passing on recipes that make the most of our wonderful local produce. Weddings and parties are also a big part of our life and, after several years’ experience, the team is happy to offer tips of the trade to help make such special events joyful. Every celebration is unique, but we know planning cuts the stress and makes all of them run more smoothly. I would be delighted to get your feedback and suggestions on information for making your visit to Cornwall a great one. Leave a message on our Facebook or Instagram page and I will do my very best to feature your request in a future blog post.